One of the key questions we had was: precisely how old was the Carnoustie hoard? This is where the wooden scabbard (identified by Archaeobotanist Susan Ramsay as made of thin strips of hazel) was important because unlike metal, this could be radiocarbon dated. 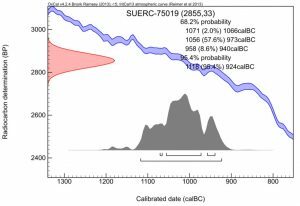 In September 2017, we received the radiocarbon date for the wooden scabbard from the Scottish Universities Environmental Research Centre in East Kilbride. The radiocarbon dating revealed a 95.4% that the scabbard dated to between 1118 BC and 924 BC. This is very significant new evidence because it not only dates the burying of the hoard to around 1000 BC but is one of the few direct scientific dates for such Late Bronze Age metalwork in Britain (because most of such metalwork has no organic remains that can be radiocarbon dated). This entry was posted in Blog on September 12, 2017 by Author.